If this blog had themes, I’m sure one fairly major one would be ‘Changing my Mind.’ And lest readers consider me a fully paid up zealot of the ‘Knowledge Devotees,’ let me tell you that I have only recently changed my mind about teaching vocabulary. When I began teaching at Michaela, I picked up someone else’s timetable; someone else’s classes. I was totally at the mercy of those who had begun their learning, and it was my job to learn how to teach in the ‘Michaela Way.’ I knew what I was getting myself into, and bit my tongue when one particular sheet came my way. It was a sheet listing 45 difficult words, split into three columns of 15, each with a one (or very few) word synonym. ‘What do I do with this?’ I asked. ‘They learn one column a week – meaning and spelling – and then you test it,’ replied Joe Kirby. Not wanting to be that challenging complainer on day one, I said nothing. But I thought: ‘no way will this work.’ Everything I’d read, everything I believed, told me that rote learning vocabulary was a bad idea. It was far, far preferable to read widely, flag up new words, and allow children to just absorb them. The first week, almost every child in the class scored zero out of fifteen on the words. (Here is the test: Me: ‘what’s a better word for determined beginning with “t”?’ Kids: ‘….’ [Meant to write down: ‘tenacious.’) Part of me felt vindicated – this was too hard, and totally pointless. But I trusted Joe, and I’d been wrong before. I was prepared to find out if this was partly my fault. ‘Didn’t you test them orally first?’ asked Joe. I had not. ‘Did you do a few every day at the beginning and end of lessons?’ I had not. ‘Did you give them time to green pen afterwards, looking at a few they had got wrong to really work on them?’ I had not. I drilled them the whole next week, and tested them again. Half of them achieved 5 out of 15. The other half achieved zero. Was the idea rubbish? Was I rubbish? Were the kids rubbish? With lots to do, I had no time to rethink the Michaela vocabulary strategy, not halfway through the year with already boggled children. I kept going. And as the weeks went by something started to click. It wasn’t just that the kids were starting to achieve 10, 11, even 15 out of 15 – and they were. (I had even taken out my letter cues, saying: ‘what’s a better word for determined?’ ‘Tenacious,’ they would write, spelling it correctly.) It was their paragraphs that showed the impact. They were astonishing. And that’s when I realised that while part of writing an analytical paragraph is knowing about character, plot, quotation, technique and context and combining all of that knowledge to write about it; the other part is having the words in the first place. The good words. One of my year 7 classes learned the vocabulary. Inexplicably, I didn’t teach the other class the words. The gap between their paragraphs has grown and grown. The difference? Vocabulary. I am teaching the same lesson to each class – usually one straight after the other – the same concepts and ideas. They are reading the same thing, and I am saying the same thing to them. But class 2’s paragraphs contain mediocre vocabulary. And vocabulary loves vocabulary, like all knowledge loves knowledge. Class 1 are always on the look-out for new words. Supported by their extraordinary form tutor, Ms Clear, who notes down key vocabulary from their class reading (done in tutor time in the afternoon) and tests them on it, Class 1 have actually started teaching me words (not sure yet if this is a low or a high point of my teaching career). Yes, the kids really struggled with this at first. And they still get it wrong in context – one said recently: ‘The Arctic is the zenith and the Antarctic is the nadir of planet earth.’ Obviously wrong. But the list isn’t everything – it is the beginning of their accurate use of these words. Having this list committed to memory means the kid can say the above sentence, be corrected in front of their peers, and learn more about the correct context for these words. I used to believe that kids could absorb vocabulary. On some level, I still believe this – if kids read widely enough, their vocabulary will inevitably be better than their non-reading peers. But it isn’t enough, not for any kid, to rely on this. They need to learn words by rote. The more they learn, the more they use these words, and the better their vocabulary becomes. I was absolutely wrong and Joe Kirby was absolutely right – a common theme in my teaching career. 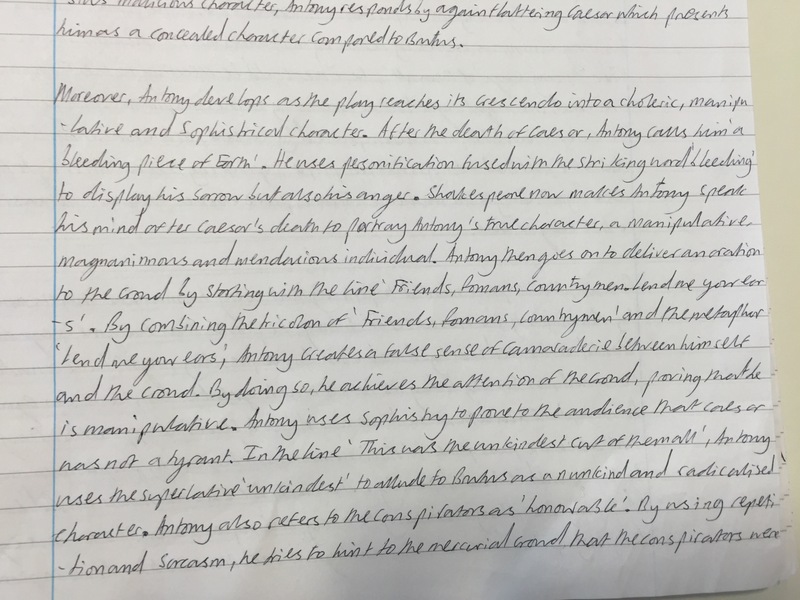 Here is a paragraph from a year 7 exam, done on Julius Caesar and entirely from memory. Moreover, Antony develops as the play reaches its crescendo into a choleric, manipulative and sophistical character. After the death of Caesar, Antony calls him a ‘bleeding piece of earth.’ He uses personification fused with the striking word ‘bleeding’ to display his sorrow but also his anger. Shakespeare now makes Antony speak his mind after Caesar’s death to portray Antony’s true character, a manipulative, magnanimous and mendacious individual. Antony then goes on to deliver an oration to the crowd by starting with the lines ‘friends, Romans, countrymen: lend me your ears.’ By combining the tricolon of ‘friends, Romans, countrymen’ and the metaphor ‘lend me your ears,’ Antony creates a false sense of camaraderie between himself and the crowd. By doing so, he achieves the attention of the crowd, proving that he is manipulative. Antony uses sophistry to prove to the audience that Caesar was not a tyrant. This pattern was replicated throughout the essays I was reading. The difference between the great and the good was often the words they had in their memories to use. There are two changes I would make to the Michaela Vocabulary Strategy for next year. The first is chunking: I’ll be setting five words a week for the first few weeks. 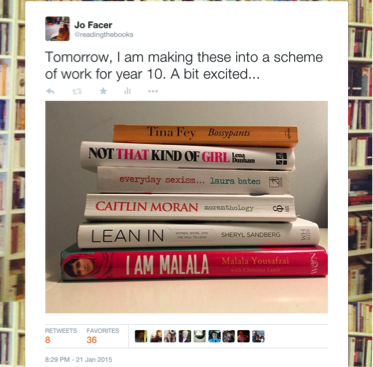 Success builds motivation, and those first weeks were depressing for pupils and me alike. We can build up to 10 and 15 words as the year goes on. The second change is to make sure that every single class learns these words. As Wittgenstein says, ‘the limits of language mean the limits of my world.’ With every word learned, those limits expand just a little bit more. Here is a grid for year 7, with thanks to Joe for letting me share it. At Michaela, we have two exam sessions each year: in February and the end of June. Nonetheless, when completing a unit we do sometimes give pupils an assessment to see what they can do. Recently, our year 8s finished learning about Romantic Poetry. To really stretch them, we decided to give them a poem they had not seen before, and ask them to write on it. The responses were phenomenal, and you can read some below. But today, I want to focus on how we give feedback following such an assessment, using a specific example. I visited Joe Kirby’s year 8 lesson, just at the moment he was testing them on the words they had misspelled. He tested them on the spellings (in the same way as I have written about previously here) and then went on to look at what else the pupils needed to do to improve their essays. After this, pupils re-wrote a paragraph in their books. The above approach is simple, and requires no marking. The teacher reads the essays, noting down examples of great work and ‘non-examples’, or examples of what not to do. The teacher then structures the feedback in a clear way, for us beginning with accuracy, moving on to ‘non-examples,’ and finishing with exemplars. The second powerful tool is in-class feedback. With an excellent behaviour system, silent writing for 25 minutes means I can see every child’s paragraph twice while circulating, giving them suggestions and tweaks while they write. On my colleague Lucy Newman’s suggestion, I’ve also started using my visualiser more. This way, we can take a pupil’s book, display it to the class, and show pupils how to edit their mistakes in that very lesson, just by giving oral feedback on the common errors they are making, or the aspects they really need to focus on improving. I was increasingly excited about the prospect of teaching some of my favourite texts to my year 10 class. I’ve written about year 10 before, but in a nutshell they are an intervention group whose literacy could be better than it currently is. 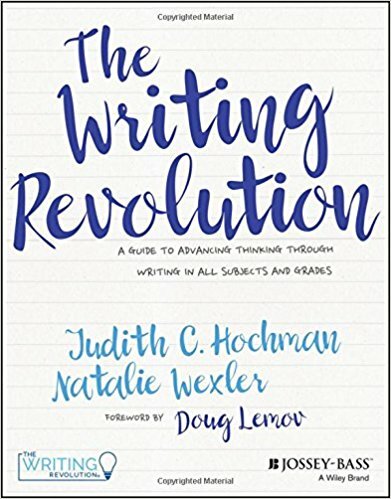 My main aim for the scheme of work was to build their vocabulary and improve their creative, informative and persuasive writing skills through exposure to some of the best examples I could find. Oh, and I wanted to make them feminists. I teach in an all-girls’ school, and so this kind of aim pretty much suffuses our curriculum, not to mention the SMSC and other varied acronyms. I’ve written before about feminism’s place in the classroom, so perhaps this scheme of work was partly my way of making such arguments heard and understood. Because I don’t think we can take it for granted that our students are cognisant of the challenges that might face them because they are girls. Despite continually out-performing their male counterparts in the education stakes, girls continue to enter a world in which women, to paraphrase Sheryl Sandberg, are not making it to the top of any profession anywhere in the world. Women continue to do the vast majority of housework and child rearing, and they continue to earn far less than men over their careers. More terrifyingly, our children are growing up, as the film Miss Representation makes clear, surrounded by media which dictates that girls looking attractive to men is what matters. Yet the message of feminism is by no means undisputed. Sandberg has been critiqued for exploring only a very tiny subsection of society in her analysis; Roxanne Gay has pointed out that women of colour are experiencing gender inequality in different ways which must also be heard; Caitlin Moran has been called “dismissive” for her comments on the hijab and why women ought not to be wearing it. This is a complex discourse, and one I very much would like my students to be able to enter into. I’ve pasted the lesson powerpoints below, but will be making some key changes in preparing a similar scheme of work for the new Key Stage 4 curriculum. The revised scheme will be longer – six weeks instead of three. It will span a greater length of time, and take account of these alternative feminisms. It will be focused on key questions to interrogate, rather than key texts to read. I’ve posted a week-by-week below in case this is of interest. I’ve also omitted textual exploration of masculinity, although we did watch the trailer for The Mask You Live In and go on to explore depictions of masculinity in adverts. This kind of scheme taught in a mixed school would definitely benefit from more gender balance, perhaps including the “He for She” campaign and exploring the challenges boys and men face in today’s society. If we need to teach non-fiction, I do think there are some key messages we can use those schemes of work to put across to young people. There are too many inequalities in our society; I want my students to be empowered and inspired by knowledge and understanding of these inequalities to put them right. Key question: how are women seen in today’s society? Key question: do women everywhere experience the same freedoms and constraints? Key question: how has the female experience changed? Key question: Is there a female voice? Key question: how successfully do women convey messages in a political setting? Key question: how are women seen, and how do they see themselves?